“You realize she’s so made that it’s as if at any moment, at her own whim, her body could cease to live, could just thin out around her and disappear from sight, and that it’s in this threat that she sleeps, exposes herself to your view. That it’s in the risk she runs, with the sea so close and empty and black still, that she sleeps.” – Marguerite Duras, an excerpt from 'The Malady of Death'. Here. The perfumed hour, the still one. Salacious musk and orange-blossom scent. Irreverence and nightshade. Golden light flickering through the terror in the ceiling. Sills, full of flowers. Light, sensual in every creeping movement. Toying, tempting. Devouring. The savage, onset of Winter, doing similar to the flesh of I. Violencing. There’s bloodlust in these eyes and the thirst of the sea in this head. All thoughts exist only to be drowned. And how the cold eats. Winter filling my soul with its shivered bite. Frostbitten tongue, a reminder of this fragmented love. A love rooted in a desire for escapism, a pull towards romanticism and neurosis. Winter. I, could sleep inside of you. It’s funny how I fall so easily. In love, out of love. Just as fast as the return of season. The strength of the weather, dictating these moods. Coolness, starkness, happiness. Warmth, passion, rage. I live for each fleeting temporal just as intensely as the other. Though, I only desire strength. A smouldering strength. I give myself to it fully. Don’t ever let me dilute me. And then there’s this Fennel Pollen Panna Cotta with Honey and Caramelised White Chocolate. The world of panna cotta, so seemingly new. It’s taken me too long to get around to creating one. And now, I’m dreaming in panna cotta flavour combinations more than I care to admit. The coolness, the sticky-sweet, the honeyed gelatinous taste on tongue. I love it. Fennel pollen, a new revelation. It has this slight-yet-present aniseed, savoury, note that I just adore. Coupled with all things intensely sweet? It’s perfect. 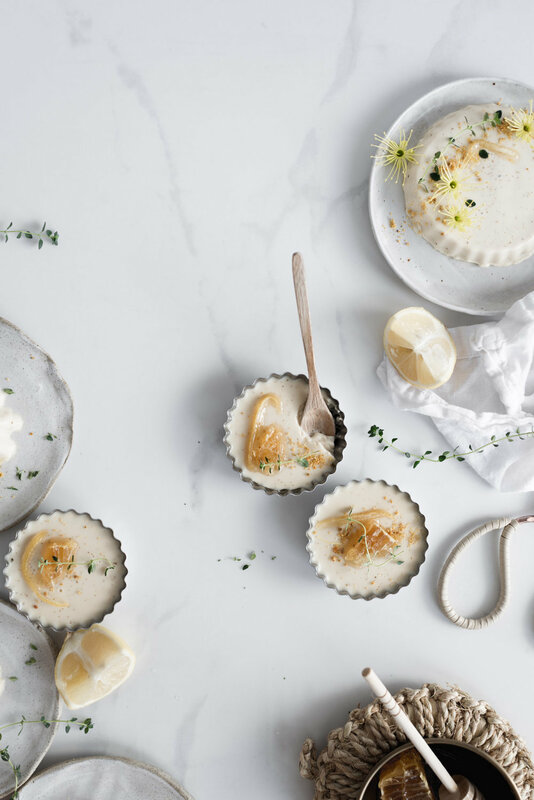 You could infuse the panna cotta with whatever you have on hand. Play around with the herbaceous notes. Use whatever bloom is in season. Chamomile, lavender. Spring. Rose, violet. Summer. Lemon-verbena, fennel pollen. Winter. You get the gist. There’s fragrant orange-blossom honey in the panna cotta too. Fleur d’Oranger reminding me of my youth. And the dulcet velvety-tones of caramelised white chocolate. It’s a forever kind of ingredient. I used Valrhona’s 32% Blond Dulcey Feves. They add a buttery, toasted, goodness like no-other. You could use regular white chocolate. It’ll still be sweet enough to sate. But, if you can, source the good stuff. 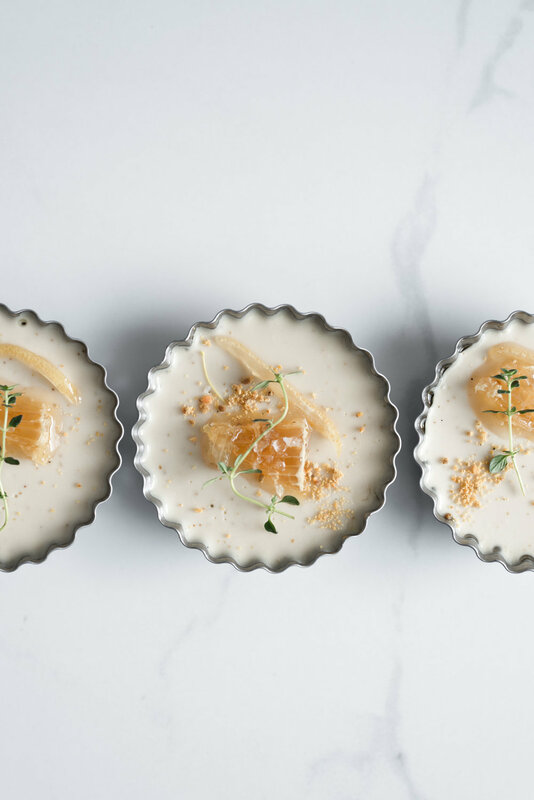 It makes this Fennel Pollen Panna Cotta with Honey and Caramelised White Chocolate just that little bit better. Either way, it’s all delicious. Pour half the cream into a small bowl. Sprinkle over the gelatin and give the mixture a gentle stir. Set it aside to bloom, about 5 minutes. Place the remaining heavy cream, buttermilk, orange-blossom honey, vanilla, fennel pollen and salt into a large heavy saucepan. Pour in the bloomed gelatin and cream mixture. Set the heat to medium-low. Stir with a wooden spoon until smooth and combined. Increase the heat to medium. Cook, stirring often, until the mixture is just about to reach a light rolling boil. Small bubbles should consistently be starting to surface around the edges of the saucepan. Remove from the heat and gently stir in the white chocolate until smooth. Set the mixture aside to steep, about 20 minutes. 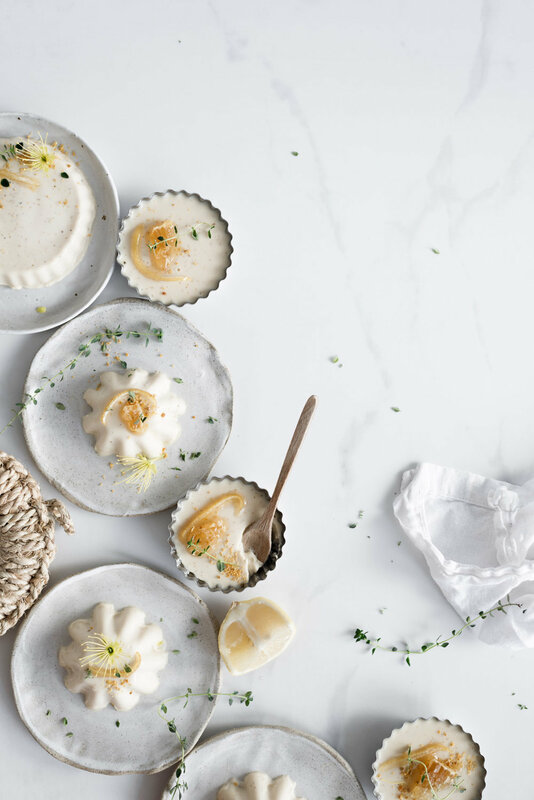 Meanwhile, lightly brush six to eight moulds or ramekins with a little bit of neutral oil. Set them aside on a baking tray. Once the mixture has infused and cooled slightly, place a fine-mesh strainer over a large bowl. Strain the mixture, making sure to discard of any lumps or large pieces of fennel pollen. Ladle the mixture into your prepared moulds or ramekins. Then, place them in the refrigerator to chill until firm, about eight hours, or preferably overnight. When you're ready to serve, un-mould the panna cotta's. Place enough hot water into a shallow baking dish so that it reaches half-way up the sides of the moulds or ramekins. Set a panna cotta in the hot water for about 15-20 seconds then immediately invert it out and onto a serving plate. Re-peat with the remaining panna cotta's and refresh the water as needed. Adorn the panna cotta's with a sprinkle of bee pollen, a strip of candied lemon rind (I like to use Ottolenghi's candied lemon recipe here) and a little bit of honeycomb, if desired.